- Axis of Evil: The first big stand up comedy act in Bahrain! The Axis of Evil perform live in Bahrain over two days, and get the whole country laughing! We cover the event, check it out! 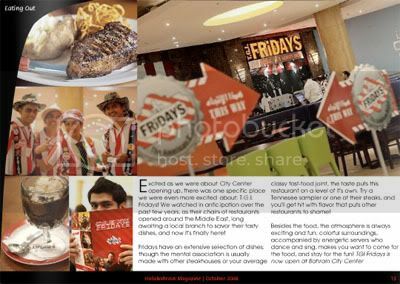 - TGI Fridays: The popular joint finally makes it's way to Bahrain! Great food & great times are sure to follow, we check out the restaurant in all it's glory! 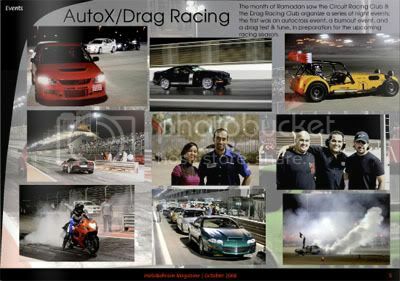 - AutoX: Racing junkies will love the autocross events going on at the Bahrain International Circuit! Bring your car and join in! - Also in this issue: Elham group art events, Gergaoon at Heritage Village in Muharraq, Amr Diab performing live for Eid, and the first taste of yummy Krispy Kreme! We also have a BahrainTalent special, covering Ed Buzzerk (house and trance), Hasan Hujairi (playing traditional Oud), and DJ Outlaw (hiphop & RnB)!